Terri Hat and a Pattern Give-away! Lion Brand Thick and Quick Super Bulky Yarn, Classic Elite “Forbidden,” Cascade “Lana Grande,” Rowan “Big Wool” or any super bulky yarn with about 75 yd (69 m). And yes, one lucky reader will get a digital copy free by just leaving a comment about the kind of hat would you like to wear or work on. Don’t forget to leave your email (eg. littlesweetknittings at gmail dot com). The give-away closes on Friday, October 15, 2010 and a winner will be announced the next day on October 16, 2010. 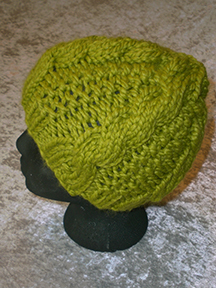 To purchase Terri Hat pattern in PDF now click here or go to the Shop page. This entry was posted on October 9, 2010, 10:11 pm and is filed under Patterns. You can follow any responses to this entry through RSS 2.0. You can leave a response, or trackback from your own site. What a gorgeous pattern! 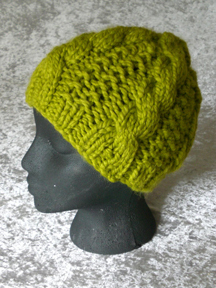 I’d love to be making a Terrie Hat! I just Love to knit this hat for my daughter. Terrie is the exact hat that I _didn’t know_ I was looking for that I’d like to make!! I love it. I especially like the way the ribbing blends into the cabling pattern. My granddaughters are going to love this. Thank you for creating it and sharing with us. Love this pattern, I’d love to make it!